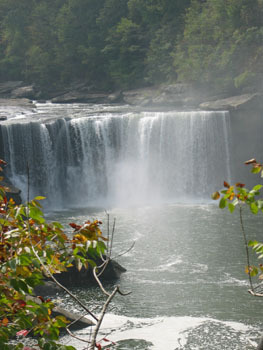 Cumberland Falls State Resort Park in the Daniel Boone National Forest is Kentucky’s most visited state park. No wonder–with 125-foot wide Cumberland Falls as its central attraction and exceptionally nice accommodations, the park is a perfect getaway destination. Gorgeous red and gold color in the fall—a scene rivaling leaf-peeping in the Northeast–add a bonus to the already outstanding landscape. For families and active visitors, the Cumberland River winds through the park providing ample opportunities for whitewater rafting, horseback riding, or hiking. During our visit, my husband and I walked an easy path to get a better view of the second largest waterfall in North America (often called the Niagara of the South). What an impressive sight–a wide curtain of water roars and crashes 60 feet into a gorge below sending up a misty spray. It’s a stunning view that reminds you how powerful flowing water can be. On that sunny day, we watched as water streams glistened in the light; and we heard that on a clear night with a full moon, mist rising from the Falls creates a moonbow, the Western Hemisphere’s only such phenomenon. 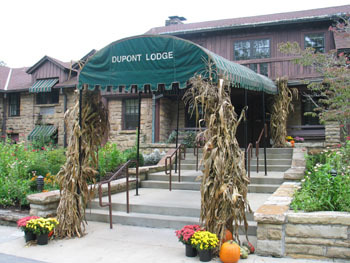 While visiting the park, we enjoyed a buffet lunch at the restaurant at Du Pont Lodge, state-owned facilities. Du Pont grounds are exceptionally well groomed and maintained, more like a resort than a state park (hence the name). During our fall visit, gardeners were planting dozens of pots of yellow mums in the flower beds. The Du Pont Lodge is known for its rustic appearance–solid hemlock beams and knotty pine paneling and massive stone fireplaces. Fifty-one rooms offer beautiful views and full amenities including interior corridors. 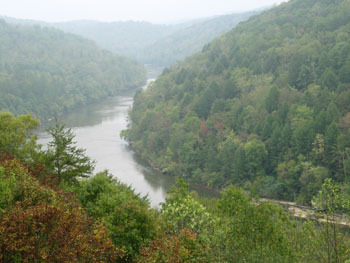 A large observation deck overlooks the Cumberland River winding thru the hills. Although it’s one of the state’s most scenic spots many travelers are not aware of the beautiful river, falls, and thick forests in the region. 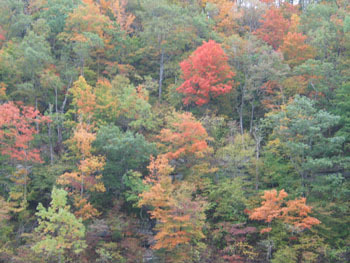 If you have overlooked this state park, there’s no better time than fall to put Sumberland Falls State Resort Park in Southeastern Kentucky on your itinerary. Read more of Beverly’s travel stories at Going on Adventures and Austin Adventure Travel.